Some exuberant youths decided to “do some noble work”. A moral light should be ignited in the darkness of immorality engulfing the country. Our national livelihoods, which have been plummeting downwards, should rise once again. A pure, refreshing stream of nationality should flow in the veins of our friends in the nation. Naturally, the youth leaned towards literature and education. A bud of aspiration was sowed in 1965; Rashtrotthana Parishat began its journey. More than 1200 people who were active in various social domains, including many authors from 160 villages of Karnataka and many other states donated wholeheartedly to establish Rashtrotthana Parishat and became a backbone of this organization. The Parishat was officially registered as per the society registration act – 1960 (Mysore act Sl. 17 of 1960) on February 27, 1965. Social awareness (cultural awareness), social education (group education) and people service (social service) – these are the guiding principles of Rashtrotthana Parishat. ‘Utthana” Kannada monthly was started on Vijaya Dashami of 1965 (5-10-1965) as the first step. Many great writers of Karnataka, such as Shivarama Karant, DVG and others shared their views here. The magazine earned the love and affection of the people in state with progressive thinking that was hard to come by in those days. The activities of Parishat, which was thus started by embracing the world of service as its life’s mission, has spread throughout the country through various social, educational, cultural activities. Over the years, the organization has spread its wings and expanded its service to various domains such as book publication, which tries to inculcate the knowledge and customs of Indian society to the young and the old generation alike; Rashtrotthana communities which operate with a view of socio-cultural developments; educational institutions that aim to create a well cultured, patriotic society; ‘Tapas’ and ‘Sadhana’ educational programs that identify talents hidden under the poverty and train them for reputed education; promotional campaigns that strive for the reforms of slums; blood banks that provide quality blood for the needy beneficiaries; “Sanraksha” which provides completely free treatment for children who are suffering from a disease called talassemia where quality blood is not produced in the body; Yoga centers that shape healthy, strong men and women; Nandagokula, which is committed for the development of less privileged, parent-less children; Go Shala, which is committed for the protection and growth of indigenous cows; and many more. 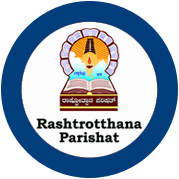 Rashtrotthana Parishat is a unique organization. Very rarely you will find that so many activities have been taken up by a single organization. Revered Shri. Veereshananda Swamiji, who had witnessed our services, had expressed his appreciation by saying that “Rashtrotthana Parishat is rendering international quality service”. The seed of a banyan tree, which is almost invisible at the beginning, becomes so mammoth when it grows up, that it creates its own world. One of the best example for this is Rashtrotthana Parishat. From Masti Venkatesha Iyengar to Gopalakrishna Adiga, S. L. Bhyrappa, various noble men of the land have always blessed our efforts and we consider them our conscience keepers. In the initial fifteen to twenty years, it was very difficult to conduct even the primary level planned activities. One can say that it was hand-to-mouth-existence. The next twenty years were the time where we believed that we can take up and any task and could give it a satisfactory conclusion. We believed that we need not step back from any socially committed activities and we can stride forward. That was a period where our confidence to serve was high. These days, we are in a position where the society decided our agenda. The society guides us saying that you need to build a school here, build a Go Shala there, build a blood bank and so on. Following on the valuable guidance of Late Yadavarao Joshi of RSS, who said do not wait for the right opportunity – create such opportunity and proceed, Rashtrotthana Parishat is always in search of service opportunities and taking firm steps and progressing ahead as per the Sanskrit phrase “Charaiveti Charaiveti”.